Sophie is a white Siberian pup with a hint of red and dark, chocolate eyes. This 7 month old puppy came to us extremely shy. With love and patience, she quickly realized she was safe and learned from the other pups around her. She is still timid with strangers, but quickly warms up and shows her spunky, funny side. 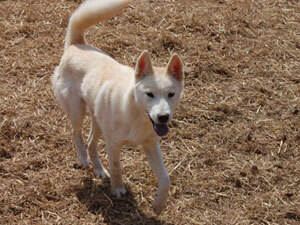 Sophie is full of puppy energy and loves to play with the other huskies. She is first to start a game of chase and a friendly wrestling match with her other canine playmates. She is always ready and eager to take a break to say hello and give kisses to the volunteers. She is a smart girl and has begun working on her basic training. Sophie will be best placed in an active home with sibe-savvy people and another active dog her size or larger, preferably a male. If you are ready for a puppy challenge and are willing and able to devote time and effort for her continued training, this gal could be waiting for you!